I am a scorpio. I don't particularly like hot weather. I prefer sweaters to swim suits. The sound of rain makes my soul happy. Do you know what I'm getting at? Fall!! My favorite season of all is almost here. I was a bit preemptive, it is, sadly, 90 degrees outside today, when I decided to make this wool dress, but I couldn't help myself. 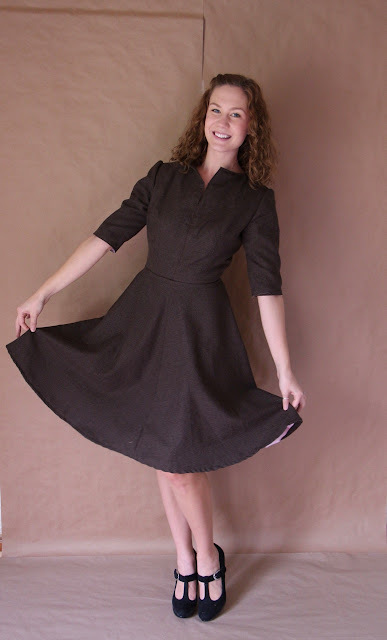 This lovely dress was constructed using vintage Vogue #7637, and new 100% wool fabric in espresso brown. The wool isn't quite crepe, it's not quite gabardine, I'm not sure what it is. It hangs beautifully, has a nice amount of body and was an absolute dream to sew with. 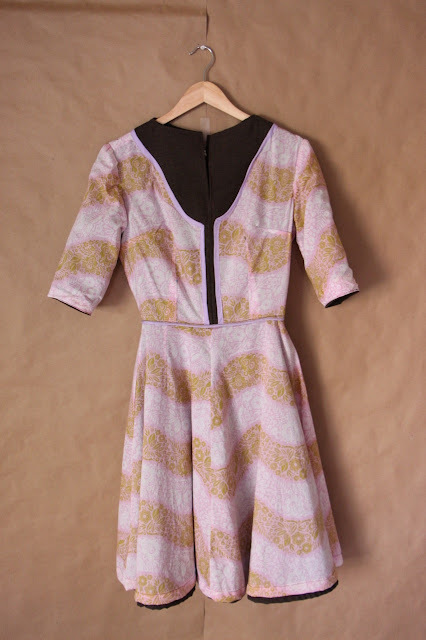 This pattern features a fantastic notched neckline, and a full almost circle skirt (constructed of 4 panels). 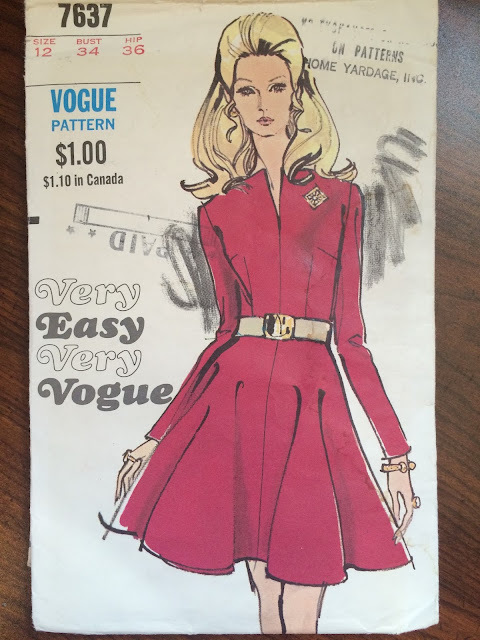 The pattern has 5 main pattern pieces and a single interfacing piece. I fully lined the entire thing with a 100% cotton voile to prevent any excess itchy-scratchy-ness. I enlarged the armscyes because Vogue patterns are always too small for me there. I also made the sleeves 3/4 length, instead of full length. It has a metal zip, and hook and eye closure in the back. The hem was a little tricky because the skirt gains so much length in it's circumference, but a simple basting stitch at the bottom (which I pulled slightly) helped to create an even hem. And because I'm always proud when my garments look as nice on the inside as they do on the outside, I have to share this!! Weeeeee! I see this dress paired withs scarves, blazers, jackets, and everything from flats to boots in the coming colder weather. I kept the design simple and avoided any extra color or textured on the exterior in order to create a good, warm, staple piece for this winter. What winter projects are you working on? I'd love to see other seamstresses wool dresses, too!